Proper shrub and tree pruning is critical to preserving the natural beauty of your landscape and promoting health within your plantings. That’s why O’Grady’s Landscape incorporates a pruning service as an integral part of our lawn care packages. It’s this process that allows landscapers to remove dead or dying portions of trees and shrubs, making for a more visually appealing outdoor space, as well as a healthier one. If you’re looking for a comprehensive lawn care package that covers all your pruning needs, know that we have you covered. We offer all the services you need to bring out the natural beauty in your shrubs and trees, from pruning to fertilization to weed control, and have years of experience doing just that for clients throughout Northern Virginia. Call us today at 703-533-5001 to learn more about our pruning service, available in Great Falls, the City of Falls Church, Vienna, McLean, and North Arlington. Note that in order to achieve the desired results—i.e. improved health and aesthetic—it’s important that all trees and shrubs are properly trimmed. Possible techniques include crown and canopy thinning, crown canopy lifting, and dead wooding, but the method we’ll actually use depends on your specific landscape and plantings. Before we begin the pruning process, our skilled arborists and landscapers will evaluate the scope of your property and the condition of your shrubs and trees to determine the best approach on a case-by-case basis. Proper pruning requires a certain degree of skill and experience, as well as a careful approach to each detail. To maximize the life of your trees and shrubs, and ensure continued health, beauty, and safety, you won’t want to take chances on just any tree trimmers in the Northern Virginia area. Fortunately, O’Grady’s Landscape has the commitment and experience to get the job done right, and we welcome the largest of pruning jobs for your convenience. 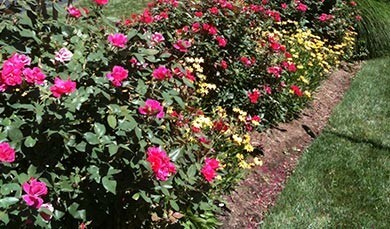 Enjoy long-lasting health and beauty within your landscape. Call O’Grady’s Landscape today to learn all about our lawn care packages in Great Falls, the City of Falls Church, Vienna, McLean, and North Arlington.